Eggnog. The delicious, and nutritious, meal in a drink. Before you take down your Christmas tree, I’ve got a few memories from my Christmas I’d like to share. Congratulations! You and I have just survived the most major holiday of the year; and we’re about to jump into the next one. As January 1st creeps ever closer I realize that I haven’t journaled any of my Christmas. If you remember; last year I rocked a solo Christmas. 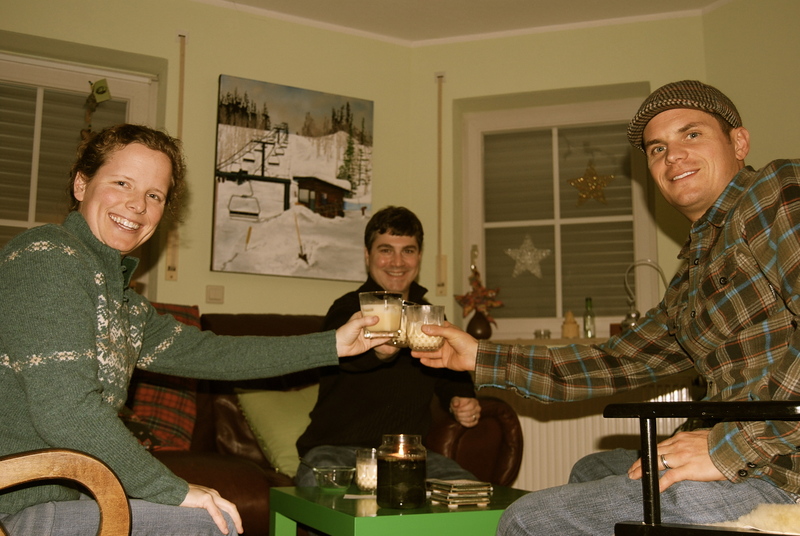 So this was Phil’s first Christmas in Germany; and we were also fortunate enough to have guests. Our friends arrived on the 23rd. Needless to say, the festivities started early. Our friends are good ol’ southern folk, and they’d been traveling through Europe for a week by the time they reached us. For these reasons Phil and I wanted to serve an awesome, home cooked, southern inspired dinner. We’d been keeping a friend’s gumbo recipe for almost three years without ever trying to make it ourselves. The time was right for us to cook it. Most likely due to the fact that it had been so long since we’d eaten it; the gumbo tasted amazing. It was just as amazing as we remembered. The dish doesn’t come together in a snap, though. It’s a multistep process; one that I actually started to plan in late November. I know that sounds ridiculous but it’s because I couldn’t find file powder here in Germany. (Duh) Luckily, I found a nice spice retailer on Etsy and the gumbo making process ensued from there. On the 22nd I spent over an hour making a golden brown rue. Then, to flavor the gumbo, I had to cook chicken parts that never get served in the gumbo. I’m sure most of you (unless you are a southerner) are scratching your heads right now. Due to the fact that modern humans don’t practice labor-intensive cooking; I will spare you the recipe. Then came December 24th. My favorite part of Christmas Eve this year was trimming the tree. I think I must find true enjoyment in hard work, because this too was a multistep process. Last year Phil and I celebrated a late Christmas in February. I bought a second-hand Christmas tree, but I couldn’t find ornaments. I had made all of last year’s ornaments out of origami. We didn’t want to repeat last year’s theme, so this year we needed to solve our ornament-less status. In my world one can not go out and buy a crate of balls at the dollar store to slap up on the tree. Ornaments in my world carry emotion and/or historical sentiment. To get us started Katharina and Ludwig gifted us some handmade woven ornaments that were lovely, and a few other trimmings that were a bit more humorous. 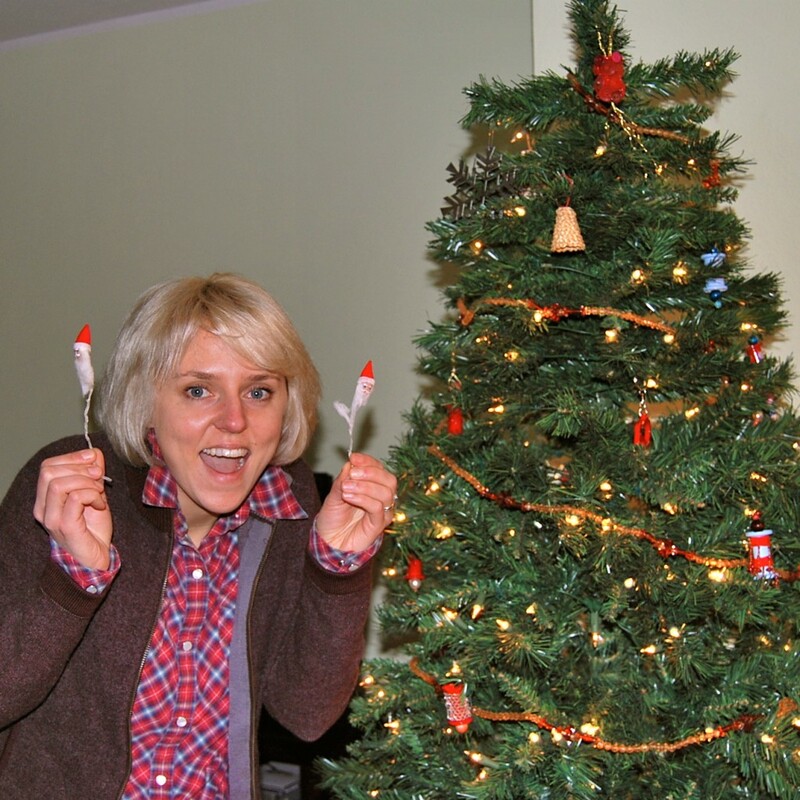 This is me with two creepy baby doll heads, decorated as Santas, on pipe cleaners. Creepy Santas are a holiday-must. This act of Christmas kindness carried us over the starting line. Then, we had friends that took a vacation to NZ in November. They had sent us a few trinkets from their travels. Can you believe there was a couple of ornaments in the box? Well, one ornament and one bottle opener key chain turned ornament. Good idea, right? If you could think of two people that need a bottle opener on their Christmas tree it would be two people who love beer. This opener will stand to be the first Christmas ornament we ever made together and we will cherish it always. 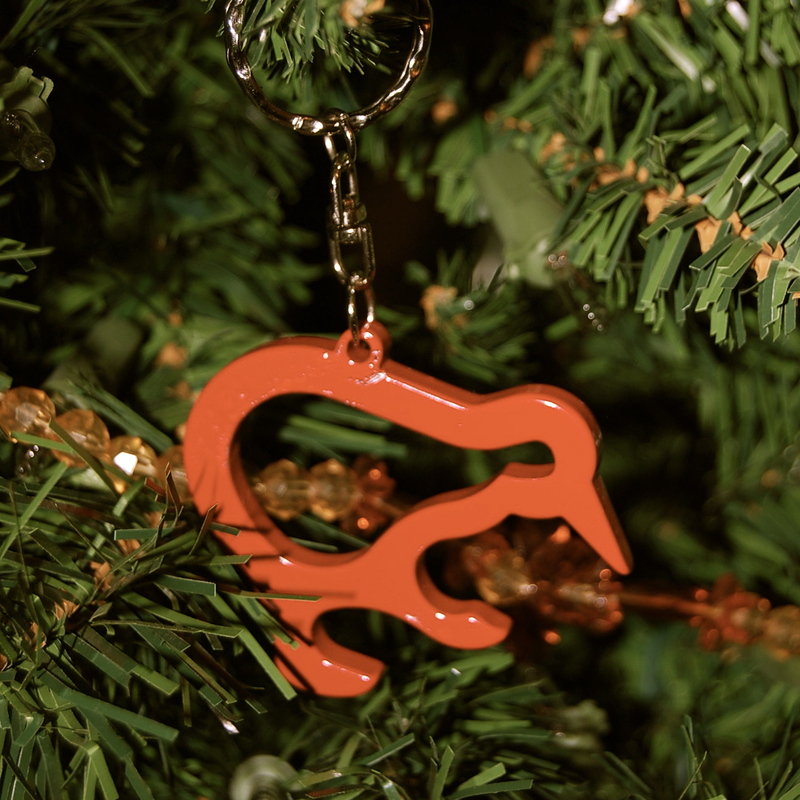 Nothing says “ornament” like a key chain. It doesn’t even need fishing line or a wire hook. This was the match that was to light a fire under a frenzy of found-objects turned ornaments. The power of Christmas spirit guided Phil in his approval of said activity. I perused my art-and-craft supplies (a.k.a. boxes of junk) and found an array of objects with real ornament potential. 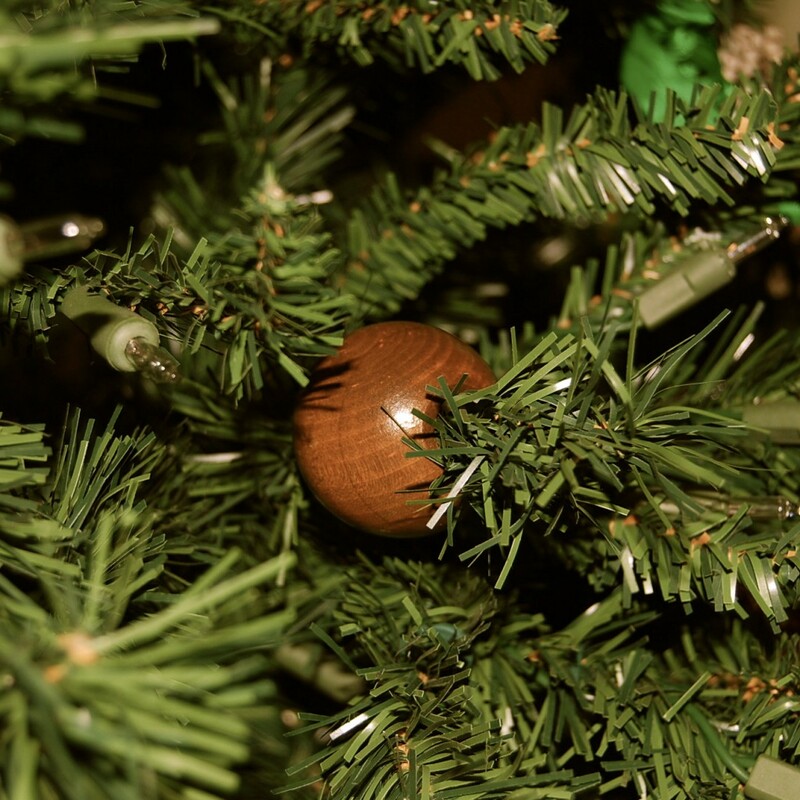 The wooden macrame bead turned hippie-dreadie-tree-bead. 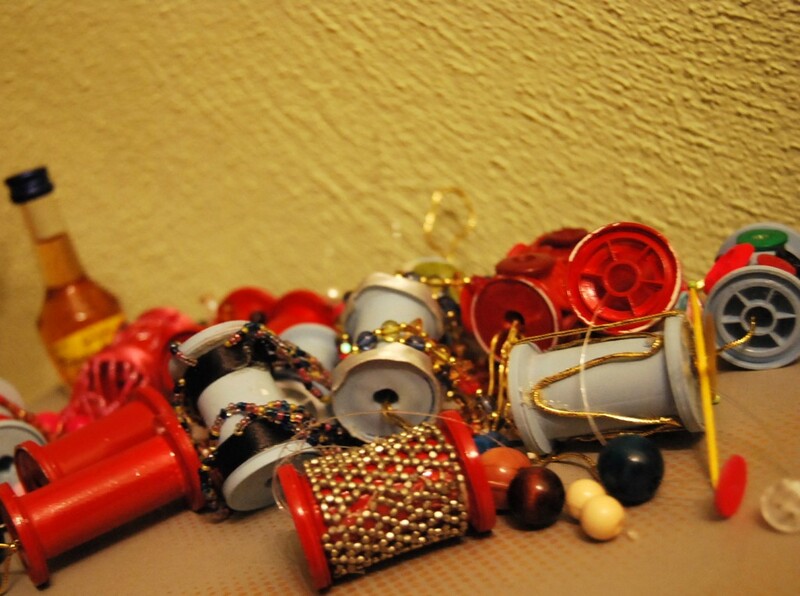 This is the bag of empty thread spools that we dressed up with spray paint and a hot glue gun. By the time our friends arrived we had enough ornaments made with love to fill the tree. The only piece missing was a tree topper. For this we thought we’d bring our friends to the Ansbach Christmas market. Unfortunately we forgot to check the time the Christmas market closed. We showed up downtown at four in the afternoon on Christmas Eve expecting to see the Christmas market still in full swing. Boy, were we wrong. I think we missed the closing of the market by hours. Ansbach was a ghost town. We were unfortunately/fortunately forced to make our own tree topper as well. After a glass of my landlord’s wife’s homemade Eierlikör (like eggnog but it already has the homemade schnapps in it) we were all up for the task and the Christmas tree came together beautifully. Christmas morning was exactly like you could imagine it. We stayed in our PJ’s, ate muffins, played Christmas music, and exchanged gifts. The rest of the holiday gang popped a cork for some German mimosas, and stirred up some Key West style Bloody Mary’s, but I was a little tuckered-out from celebrating the tree trimming the night before so I had myself a Christmas day nap. When I awoke we all went for the Christmas day hike through the woods and came home to get down to cooking. Phil’s signature dish is a grilled turkey. It’s out-of-this-world good. Europeans don’t really do the turkey so much as the goose or duck. 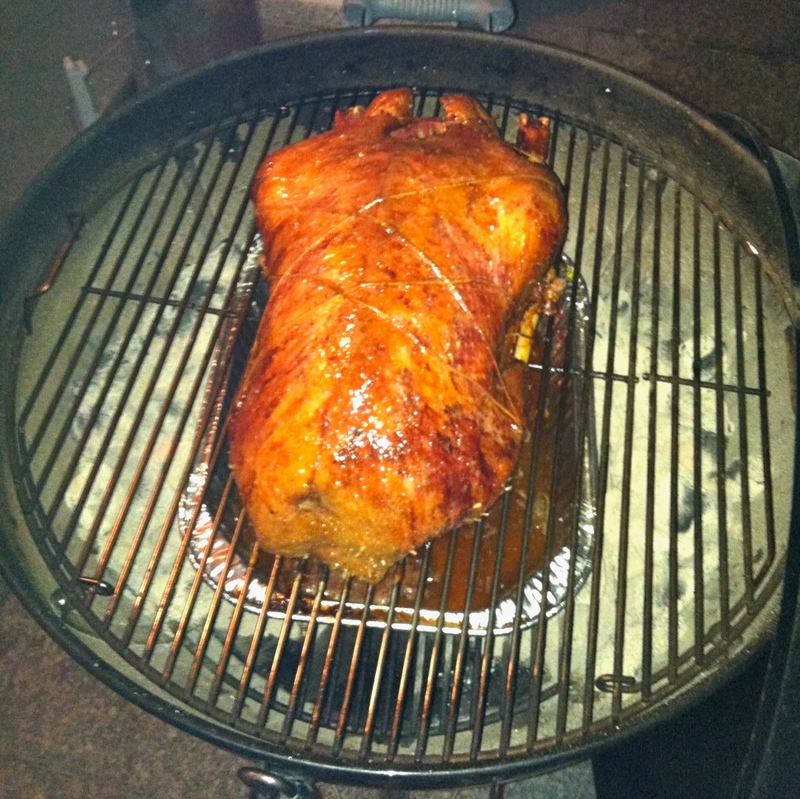 So I convinced Phil that, since we’re here, he should grill a goose. For him, the goose turned out to be more work than the turkey, with a couple of extra steps due to the fattiness of a goose, (and an extra quill ot two left in the skin) and it just didn’t yield the same explosion of flavorous delight from the dinner crowd. The goose was good, but I think it’ll be the last goose Phil ever grills; and it’s the last goose we’d ever hope to clean up after. While we were preparing our holiday feast we invited Katharina and Ludwig down for a Christmas Happy Hour. They obliged and came bearing gifts. Katharina gave Phil a big gingerbread cookie from the Ansbach Weihnachtsmarkt (Christmas market) and I got some more fur from Ludwig for scarves. Keeping with his tradition; Ludwig gave our guests the tour of the German woodsman’s home; complete with the display of trophies, skins, knives, and guns. If it wasn’t their favorite tour on this European vacation of theirs; it was (at least) heartfelt, authentic, and free of charge. You won’t find it in a guide book, but you can’t help but be impressed with Ludwig’s lust for hunting and all things German. After the commotion of happy hour, the tour, the cooking, the grilling, and the eating; Christmas came to a close. We tucked ourselves in bed to rest up for our next holiday adventure, skiing in Laax, Switzerland. This entry was posted in Craft Project, Creative Indulgences, Recipes, Uncategorized and tagged christmas, Christmas Tree, Eggnog, Goose, handmade, Ornaments.